Emerson Process Management is an automation innovator, delivering custom solutions for large, complex production equipment, and processes. Emerson’s two-story, 280,000-SF building was originally constructed in the 1960s as a manufacturing facility but evolved into primarily a corporate office workplace for design and software engineers. 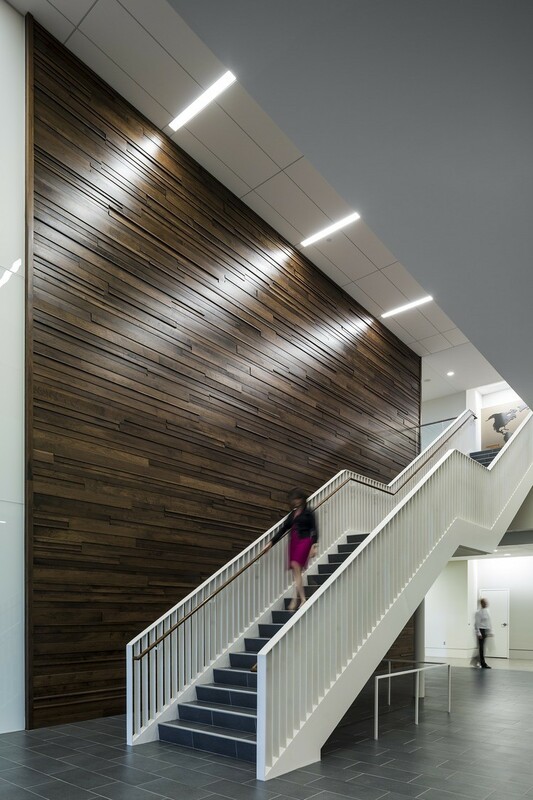 In order to continue to attract premier engineering talent, Emerson sought to renovate the existing facility into an inviting, inspiring, and efficient 21st century corporate workplace. The majority of the building’s exterior wall was replaced to provide natural daylight and views into the workplace, enhance thermal performance, and rebrand the building identity as the home of a modern and technologically innovative company. Uninsulated concrete block and stucco walls were replaced with an aluminum and glass curtain wall and silver aluminum panels. Insulation, brick, and gray-tinted ribbon windows were added to the lower level to give the exterior a unified and attractive look. Given Emerson’s space constraints, the entire interior was remodeled in phases while the building continued to be occupied. Service spaces were placed in the heart of the building, furthest from daylight. In concentric rings, a conferencing center surrounds the building center, followed by circulation, management offices, and open office workplace nearest to the new glass curtain walls. Today, the new open office workplace and dining area include numerous spaces for informal meeting, collaboration, teleworking, and other non-traditional work settings that respond to emerging trends in an office workplace serving multiple generations. What they’re doing with the building is really interesting. They’re taking an old condition, they’re recognizing environmental issues, and they’re recognizing the quality of life for their people. They’re doing really smart things. It’s quite an elegant project.